The below hill stations of India are popular with the local population and visiting foreign tourists. 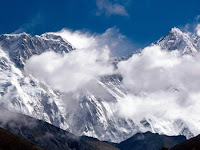 Each places are distinctively famous for its splendid nature, weather, sightseeing and altitude. Kullu Manali hill stations fall in the Himalayan ranges. While Kullu is at 4,469 feet altitude, Manali to the north side of Kullu is at an altitude of 6,398 feet above sea level. There are several ways to get into Kullu and Manali. To reach by road, there are inter-state and Himachal tourism buses and taxis that will bring you in. From New Delhi, it takes approximately eighteen hours to cover the distance of 550 kms. Travelling by air is the best comfortable option as there is an airport in a town 10 km from Kullu. Shimla is the headquarters of Himachal Pradesh and is a hill station surrounded by thick forests. There is an abundance of natural beauty here. The Shimla Ridge gives a magnificent view of the sunset. A big attraction is the acres of apple orchards. Fairs and festivals are the highlights, with the Summer Festival organized in June the most significant. The absolute musts are a visit to the Chai Wildlife Sanctuary the Shaily Peak, Arki Fort and the Himalayan Nature Park. The toy train ride is also amusing experience. 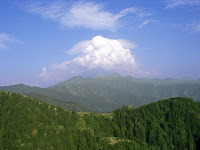 Juggarbhati is the nearest airport, approximately 12 kms from Shimla city. There are scheduled flights to Delhi. The Shimla railway station is well connected to other parts of the country. Shimla is situated at an altitude of 2,205 meters and has an amenable climate right round the year. It is less explored hill station situated at an altitude of 2,204 m with a charming plateau. The meadow is surrounded by dense pine woods. Patnitop is a good starting point for many short or long treks into nearby mountains. There are three ice-cold freshwater springs in the area said to have medicinal properties. Besides there are pony rides in lesser known trails as well as paragliding and sling facilities. Buses and taxis are available from hours to reach Patnitop. For lodging, the Jammu and Kashmir Tourism Development Corporation offers many huts and tourist bungalows equipped with kitchens as well Patnitop can be visited any time of the year, with the best time for visits being May-June and September-October. For the snowy experience, December-March is the time to be there. Munnar is situated at the confluence of three mountain streams. Situated at an altitude of 1,600 meters above sea level, Munnar was the summer resort of the past British government in South India. The sprawling tea estates which stretch as far as the eyes can behold are a visual treat. Among the exotic flora found here is the Neelakurinji which bathes the hills with flowers when it blooms once in 12 year. Munnar also has the highest peak in South India, Anamudi, towering over 2,965m. 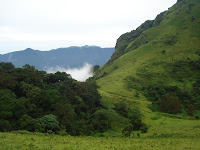 Treks are conducted to the Anamudi peak. The airports nearby are Kochi (130 kms away) and Madurai (142 kms away). The nearest railway stations are Ernakulam and Kottayam. The hill station is well connected by road. There are ample places to stay to suit all budgets. The best time to visit is September to May. 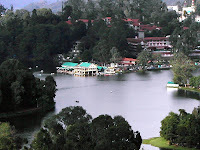 Located amid the verdant Palani Hills and with its wooded slopes, rocks, waterfalls and lakes, Kodaikanal is among India’s most charming hill stations. Kodai is situated at an altitude of 2,133 meters. Besides, many international schools located here, Kodaikanal boasts of the ‘Kurinji flower’ which blooms once every 12 years. Kodaikanal is connected by road with Chennai, Ooty, Trichy, Coimbatore, kumili and Madurai. The nearest airport is Madurai, 120 kms from Kodaikanal. The nearest railway stations are the kodai Road railway station, 80 kms away and the palani station, 64 kms away. There are plenty of facilities for staying, both private and government-owned. It is pleasant throughout the year, but the best time to visit is April June and September- October. The maximum temperature in summer stays at less than 20 degrees C.
Saputara or the abode of the serpents’ is the only hill station in Gujarat-a part of the Sahyadri ranges. It borders Maharashtra and Gujarat, about 160 kms from Surat. It is situated approximately 1000 meters above sea level. The weather is pleasant here right round the year. The highest temperature in summer is around 28 degrees C. Places to visit here include the Ropeway, Purna Sanctuary, Gira Falls and the botanical garden. Visit to the Vansda National Park is a thrilling experience. The Sunrise Point provides a sight beyond compare. The Lake Garden is a beautiful picnic spot. Private cars, taxis state transport and luxury buses are the only way to travel to the hill station. The closest domestic airport is in Surat. The closest railway stations are Waghai and Billimoria. About 60 kms from Visakhapatnam, Ananthagiri Hills is breathtakingly beautiful situated in the Eastern Ghats. It is the perfect getaway during the blistering summer months Lush during coffee plantations and mango groves, the hills offer some stunning viewpoints from the heights. The Borra Caves in the Ananthagiri Hills is a must see. The rail route on this stretch is one of the highest broad gauge tracks in the world. The nearest railhead is srikakulam at a distance of 3 kms. Besides, there are frequent bus services daily from Vishakhapatnam. Traveller’s bungalows are available in the location for stay. 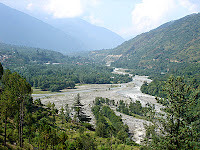 Situated at a height of 996m above sea level on the banks of River Ravi, Chamba Valley was founded by Raja Sahil Verma, who named it after his beloved daughter Champavati. The valley is surrounded by three well-defined snowy rages constituting the outer, mid and inner Himalayas. The Chamba Valley is a nature Lover’s delight with mountain passes, lakes and valleys, Places to see include the Bhuri Singh Museum, Champawati Temple and Kalatope Wildlife Sanctuary. The nearest airport is at Gaggal in Kangra velley, about 180 km from Chamba. Chamba town is located at 122 km from Pathankot. Which is the nearest broad gauge rail head and it is linked by direct trains to Amritsar, Delhi, Mumbai and Kolkata. There are hotels and home stays for accommodation. The weather is cool right round the year, with the winter temperatures plunging to 0 degrees C. The best time to visit is from month of mid-May to month of mid-October. It is located in Amaravati district in the Vidarbha region. The only hill station in this region it has an abundance of wild life, lakes and waterfalls. Situated at an altitude of 1,118 meters, it is the only coffee plant growing area in Maharashtra. Other than the scenic beauty of the place, there is the kolkaz National Park and Melgat Tiger Project here. It is around 763 kms from Mumbai. Accessibility is by road, rail or air, with the nearest airport in Akola about 150 kms away. The railway station is Badnera in the Central Railway line, about 110 kms away, and the nearest bus depot is in Amaravati, about 100 kms out. The Maharashtra Tourism Development Corporation offers very good accommodation in forest lodges and luxury hotels. Chikaldhara has a cool, breezy climate and the best time to visit is from October to June. Coorg now Known as Kodagu is an enchanting stretch of natural tourist spot situated amid the hills and valleys of the picturesque Western Ghats. Kodagu district has plentiful tourist spots of historic importance and natural beauty. There are steep hills and valleys and gorges. There are acres and acres of plantations, the crops grown here being coffee, oranges and spices mainly. River Cauvery, one of the most important rivers in the South, takes its origins here. There is no direct air connection nor is it liked by rail. Accessibility is only by road The Karnataka State Road Transport Corporation has several bus services to Madikeri, one of the three taluks and district capital. There are several hotels and resorts offering excellent accommodation. The best time to visit Kodagu is between October and April. Horsley Hills is one of the famous hill resorts of Andhra Pradesh, named after W.D Horsley who was the Collector of Cuddapah district. Horsley had chosen this spot situated at an altitude of 1,265 m for his summer residence. With a maximum summer temperature of 32 degrees C and minimum of 20 degrees C, the hills are delightfully cool in contrast with the rest of the state, and have shady slopes dense with vegetation. Various species of plants and trees can be seen here as well as bears wild dogs, jungle fowls, sambar and panthers. The 150-year-old eucalyptus tree ‘’Kalyani’’ is a big attraction here. 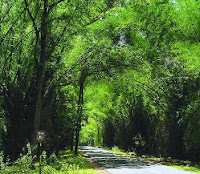 About 90 kms away is the Kaundinya Wildlife Sanctuary. The nearby airports are in Tirupati, at a distance of 160 kms and Bangalore, 165 kms away. The closest railway station is madanapalle Road about 43 kms from Horsley Hills. The Andhra Pradesh State Road Transport Corporation runs buses daily to the Hills from Tirupati and Madanapalle. This place is a big attraction with its pleasant weather, hills and valleys. Araku Valley is about 115 kms from Visakhapatnam and close to the Orissa border. The area of the valley is about 36 kms and it is situated at an altitude between 600 and 900 meters above sea level. The trip to this place on the Ghat roadway with thick forests on either side is itself very absorbing. While the Borra Caves is a big tourist attraction here, situated about 29 kms from Araku Valley, there are about 46 tunnels and bridges here as well. The nearest airport is Vishakhapatnam. Araku also has a railway halt. Bus services are available from Vishakhapatnam. For lodging there are cottages and guest houses, including Andhra Pradesh Tourism Corporation’s mayuri complex. It is the only hill station in the state. It is located on a high granite table in the Aravalli hills, about 1,220 meters high. It is built around a lake and is surrounded by forested hills. Mount Abu is well known for the Dilwara temples and other archaeological sites. The landscape includes gigantic rocks, coniferous trees, beautiful lakes and cool climate, unlike the rest of the desert state. The Government Museum in Mount Abu, set up within the premises of Raj Bhavan, preserves the archaeological wealth of the region. There are many interesting view points as well, like the Honeymoon point and the Sunset Point. The nearest airport is in Udaipur and the nearest railway station is Mount Abu Road, 29 kms away. For lodging, there are many hotels to suit every pocket and guesthouses as well. Mount Abu receives nearly 70 inches of rain. The best time to visit is April-June and October-November. Gulmarg means the Meadow of flowers and in spring, the valley of Gulmarg is just that- dotted with colourful bluebells, forget-me-nots, daisies and buttercups. The valley is a huge cup-shaped meadow about 3 kms long and ups to 1 km wide the slopes lush and green. Gulmarg looks like fantasy land, and not surprisingly has been a sought after location for the shooting of several films. It stands at 2,730 meters above sea-level and lies about 56 kms south-west of Srinagar. All around are snow-capped mountains and the road from Srinagar passes through rice and maize fields. In December the green slopes of Gulmarg are covered with snow, forming some of the finest natural slopes for skiing. It is the country’s premier skiing resort. The nearest airport is in Badgam district which is well connected with all the major cities of India. The closes railway station is in Jammu. The journey from Srinagar to Gulmarg takes about 2 hours by bus. For accommodation there are several hotels of varying standards and also Jammu and Kashmir Tourism Development Corporations’ fully furnished huts which are great value for money. In summer the best time to visit is from May to September and in winter from November to February. Nainital a hill station situated in the Kumaon Hills and surrounded by mountains on three sides. Originally, this area had many lakes and was therefore called the city of 60 lakes: With the passage of time however, most of the lakes have disappeared. 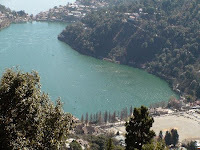 The big attraction is the Naini Lake. 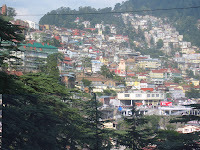 Nainital was discovered 1841 by an Englishman called Lord Barron. Another attraction here is the Snow View point located at a height of 2,270 m above sea-level. It can be reached by ropeway or pony trek. The weather here is pleasant throughout the year except during the winter months when it can get very cold. The best time to visit is in April-June and September-October. From January to March there is snowfall here. The nearest railway station is at Kathgodam which is connected by trains from Delhi and Howrah. From Kathgodam, taxi and bus service are available to Nainital. Shillong is the capital of Meghalaya, perched at an altitude of 1,496m. This lesser known hill station is also known as the ‘Scotland of the East’. There are numerous lakes and falls here, as Shillong spreads out with lush green undulating hills, cottages and cathedrals, all extending an old world charm. Nature has been more than partial here with towering pines, gurgling mountain streams and water falls. There are lakes, gorges and caverns making it a tourist’s delight. It has also been known for adventure tourism with trekking water sports and golf chalked in. The Shillong Peak at an altitude of 1,965 m is the highest point in the state and gives a panoramic view of the city. The best time to visit is in April-May and September- November. 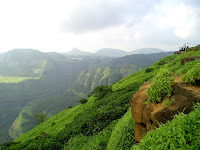 Lonavala and Khandala are two hill stations 5 kms apart, on the western slopes of the. Sahyadri ranges that straddle the Mumbai Pune highway, at an altitude of 625m. There are hills, deep valleys, lakes, forts and water falls here. They offer a breathtaking view of cascading waterfalls during the monsoon season. Lonavala is known as the ‘jewel of the Sahyadris’ where you see nature in its full splendor. Khandala is smaller and relatively calmer. The lush green waterfalls, pleasant climate and the healthy ambience draw tourists here in droves. It is easily accessible, the nearest airport being Pune, about 65 kms away. Lonavala is on the main railway line between Mumbai and Pune. Most trains plying between the two cities stop here. Besides, there is an hourly shuttle service to and from Pune. It is also accessible by road, Lonavala situated on Mumbai-Pune highway, about 104 kms from Mumbai. There are home stays, hotels to suit all budgets and state government-run resorts. These places can be visited right round the year, though the best time to visit Lonavala and Khandala is from October to May. It derives its name from the five hills surrounding it. Panchgani is a well-known hill station in Maharashtra on the highway to Mahabaleshwar from Pune. It is located in the Krishna valley in Satara district of the state. It is located at an altitude of 1,334m above sea-level with River Krishna on one side and the plains on the other end. The walk through the woods is an experience. From Table Land, a flat mountain peak here, the plains below are a feast for the eyes. Tapola is a water sports center located here. Strawberries and cream are served at several roadside stalls all along the way. The nearest airport is Pune, about 160 kms away from Panchgani. The convenient railway station is also in Pune. 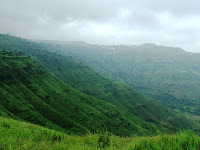 Panchgani can be easily approached by road from Mumbai and Pune. Accommodation is available in hotels and holiday resorts. The climate is pleasant throughout the year, October to May being the best time to visit. 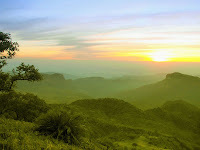 Pachmarhi is the summer capital of Madhya Pradesh, located at an altitude of 3,555 feet and surrounded by the Satpura Hills. The natural beauty of the hill station remains less exploited than other busy tourist spots. Pachmarhi is a group of water falls. There are also ancient temple and other old structures, all of which give the hill station a charm of its own. Surrounded by hills, the weather is pleasant here throughout the year. It is never above 37 degrees C in summer and winter temperatures plummet to below 7 degrees C. The best season to visit is between October and June. The nearest airport is in Bhopal and Piparya is the closest railway station which is on the Howrah-Mumbai line. Piparya is about 47 kms away from Pachmarhi. The hill station is well connected by road from Bhopal, Nagpur and Jabalpur with regular bus services. There are no 5-star hotels here, but there are many small and medium hotels providing good accommodation. Apart from hotels, there are also guest houses for staying. The horse-faced hill station situated 95 kms south-west of Chikmagalur got its name because of the unique shape of the Kudremukh peak. Largely undiscovered by tourists, Kudremukh is a secluded hill station in Karnataka retaining much of its pristine, natural beauty. Overlooking the Arabian Sea, the hills are connected to one another with valleys and precipices. Forests, rivers, grassy slopes, waterfalls and rare orchids provide an idyllic background for trekking. Situated 1,894 m above sea level, Kudremukh is rich in iron deposits.The Kudremukh lron Ore Company conducts mining operations here. The nearest railway station is Mangalore. Kudremukh is linked by road to Chikmagalur, Mangalore and Sringeri. There are hotels to stay, besides the Horticulture, PWD and Forest Departments’ guest houses. The weather here is salubrious right round the year. It is located about 16 kms from Munnar and resembles nature in its pristine glory. It is the nature lover’s paradise with the fragrance of wild flowers and rare herbs. The Sita Devi Lake has springs of mineral water and is ideal for trout fishing. The green slope touching the sky is a mesmerizing sight. Situated at an altitude of 1,800 meters above sea level, it takes about 4.30 hours to reach there from Kochi and just under 4 hours from Kottayam. The best time to visit is September to May. It is one of the 14 districts in Kerala situated in a mountainous plateau in the Western Ghats. Wayanad is the north-eastern tip of Kerala. It is located at an altitude between 700 and 2,100 m above sea level. Rainfall is heavy and summers can be hot. There are coffee, tea cardamom, pepper and rubber plantations here. Wayanad shares the borders with Coorg in Karnataka in the north, Malappuram in the south, Kozhikode and kannur in the west. The scenic beauty of Wayanad which is rich in natural resources also offers opportunities for adventure tourism. The Valliyoorkavu Festival held in the Mananthavady temple is a big attraction, where the idol is believed to be self-manifested. Then there is the Wayanad Wildlife Sanctuary. And the Banasura Dam is the largest earthen dam in India built using the ancient architectural style in Kerala. Kalpetta is the headquarters of Wayanad District. The nearest airport is in Kozhikode and it is well connected by rail and road. There are various choices for stay with hotels, resorts and guest houses. The best time to visit is from August to May. Hello there! Quick question that's totally off topic. Do you know how to make your site mobile friendly? My blog looks weird when viewing from my iphone4. I'm trying to find a template or plugin that might be able to resolve this issue.